Palawan is one of the few remaining islands in the Philippines that is still largely unspoiled, but the pressure of economics and money is making up for lost time quickly, and Coron, El Nido, and Puerto Princesa have already fallen victims to the tourist buck. Almost everything else is untouched by tourism and you can find yourself alone on white sand beaches that stretch into the unpolluted and crystal clear sea, or in a jungle set straight out of a Hollywood blockbuster, but thankfully lacking in man-eating or dangerous animals! You will find breathtaking scenery from the tops of cliffs, or enjoy secluded lagoons that could be there only for you; in short, the island is simply breathtaking and still has that edge of natural beauty that can be so hard to find these days. Needless to say, the dry months (November to May) are the best times to visit but the downside to that is everybody tends to think that way so it’s more people and prices tend to be higher especially for accommodation. If you take your chances on the rainy season (June thru November) then hotel rates are usually cheaper as are tour costs and you get the benefits of a lot less tourists being around. In the end, it’s your call depending on what’s really important to you, but the island is spectacular any time of the year. The major roads of Puerto Princesa and El Nido are well served by multi-cabs. This is good for a local commuter and for those that are looking for additional adventure. Cost is at Php 50-150 / Head if you’re going from Point A to Point B within the town. Rent A Motorbike and stroll the city on your own! Costing Php 500 (9 USD ) per pax. The van travel time is approximately 4.5 to 5 hours, including one stop for lunch, and is faster than the bus. The downside is that if you’ve got a full van it can be rather cramped inside. For van transportation, In my experience, Eulen Joy and Lexxuss Shuttle are the most reliable van service as they leave on-time, even if the van isn’t full. Other van services like Fort Wally can be cheap as Php 400 (7 USD) but they won’t leave unless the van is full. So, for those who want to save time, I would strongly recommend you book with Eulen Joy or Lexxus Shuttle both to and from El Nido. I always suggest taking a van because of both travel time and convenience from the airport. I also strongly recommend that you reserve your seat at least a day before your arrival, and to find out where to pick you up. Please note: Pickups will be done within 45 minutes before the departure time. Please be patient in cases of unforeseen delays along the pickup route. The bus is another option. Buses are more comfortable now than before, more comfortable than the vans (at least in my opinion). Wider legroom, cooler temperature, and just bigger breathing space overall. Haha. The downside: it’s slower, taking 6-7 hours. And there are fewer journeys per day. But if you’re not in a big hurry, it’s a great option. Here’s how to take the bus to El Nido. Walk to the gate of the airport. Hail a tricycle and ask to be taken to San Jose Terminal. The fare is Php 120 per ride. Split the cost if you’re a group. Alternatively, you can take a trike+jeepney combo, which is cheaper. But since I’m guessing you have heavy bags in tow, just go straight to the San Jose Terminal. Board a bus to El Nido. Two bus companies to choose from: Cherry Bus and RoRo Bus. Cherry Bus leaves every 2 hours with 5 AM. being the earliest and the last bus leaving at 9 PM The price is Php 480 (9 USD) for aircon with reclining seats, and Php 380 (7 USD) for ordinary seating. RoRo Bus is another popular and cheaper option, starting at Php 380 (7 USD) for aircon, and Php 290 (5 USD) for ordinary seating. This bus leaves every 2 hours with 4 AM. being the earliest and 10 AM. the latest. Both RoRo and Cherry Buses accept reservations but are not necessary. Just show up and ride. It’s better to plan your travel so you don’t have to waste hours thinking about what place to go when you are there. Instead, write it down on some paper/notebook (ask your mummy for some) or type it into your phone. Plus book your activities online beforehand as its way cheaper than buying it when you get there. There are more travel agencies in the Philippines that you can shake a stick at, that offer good value deals to both Puerto Princesa and El Nido. They, of course, differ somewhat for a 3 day /or 2-night package, but for a rough average think in terms of around Php 4,500 (85 USD) per person, but for the price be warned as the accommodation is very basic and typically you’ll get a bed plus access to a toilet with running water and a bucket! If you are expecting or wanting something better with an en-suite or even a more ‘western’ style bathroom, you will have to pay more and be sure to point out your exact requirements to the travel agent, so they know the type of thing you are looking for; add in views, wifi, clothes washing facilities, bed size etc, you don’t want your trip to start with disappointment and expect prices to beP hp 2,000-3,000 pesos more. If you want a proper hotel than a good one is more like Php 5,000-6,000 per night. If you’re going to go to Palawan then try to stay at least 4/5 days and this makes it much easier to plan exactly what you want. If you have only a few days, then the organized tour is probably going to be your best option and more ideal for you. (Family, Company Outing, Friends etc). – Your budget is controlled. – Takes time to plan. – Cheap package tour usually has basic accommodation. – Costly – Food may be different to your liking. What if you’re on a package tour? The provincial capital PUERTO PRINCESA, dubbed as “City in the Forest”, claims to be the only city in the country that has successfully found a happy balance between economic development and the environment. There are a few sights around Puerto Princesa, but nothing to speak of in the city itself, which is why most visitors treat it as a one-night stop on the way to or from Palawan’s beaches and islands. Around Puerto Princesa that you can easily visit in a day or fewer places such as Puerto Princesa City, Honda Bay, and the Underground River. Upon our arrival at the newly opened Puerto Princesa Airport, we waited for the van that would take us to Sabang, Puerto Princesa for our Underground River Tour. But if you’re planning to do it on your own, you can reserve a seat here for only Php 300 one way. Please note: Pick ups will be done within 45 minutes before the departure time. Please be patient in cases of unforeseen delays along the pick up route. Hailed as one of the New 7 Wonders of Nature, the Underground River located inside a national park, is also a UNESCO World Heritage Site. It is approximately 2 hours north of the city proper. On your way to the area, you will be amazed by the great views from the top view of Ulugan Bay, and marvel at the Karst Limestone Mountains and Elephant Cave. From Sabang Wharf, a motorized boat will take you to the entrance of the national park in around 20 minutes. A boardwalk winding through dense jungle thickets will lead you to the mouth of the cave. There a boatman who will also serve as your guide will take you in your boat inside the cave. Tour inside the cave would cover the first kilometer of this 8.2 km underground river known to be the longest navigable in the world which would last for about 45-60 minutes. Watch out for the bat poo! Sabang Xtreme! Longest Zipline in Palawan! If you’re planning to stay longer in Sabang, Puerto Princesa you may also try some activities like the ATV Jungle Track, Mangrove Paddle Tour and see majestic views of Sabang Beach with the Sabang X Zipline! Ugong Rock located at Barangay Tagabinet is a few minutes ride away from the Sabang Wharf. It is a cave complex where the adventurous at heart can explore. It is named after the gong-like sound some of the hollow rock formations make when tapped. It contains interesting stalagmites and stalactites and other geological wonders. The tour takes you through several cave openings until you reach the top from where you get a fantastic view of the countryside. If you have the courage and inclination, you can get down the fast way by using a 300-meter long zip line from the mountaintop. After caving and spelunking last activity is to use the zip line at Ugong Rock Adventures. In the Bacuit Bay tours, most start in the morning from the beachfront in El Nido. Failing that, they will leave from Corong-Corong beach. In any event, your travel agent should have sent you all the information you need, at the time of your booking, if not be sure to chase them before the day. Bear in mind when you book, that if you are keen to avoid large crowds, you can often choose a ‘reversed’ tour which has you going the opposite way round to the masses. All the tours tend to be around the 7-hour mark and get you back to your point of departure late afternoon in time for a swim and cocktail on the beach before dinner. Talking of eating, part of your island hopping tour will be a lunch prepared and cooked by your boat crew. This normally is fresh grilled fish, chicken, pork, rice etc ., together with fruit. If you want to drink alternatives to water that will be supplied, take your own with you, ideally in a cooler bag or maybe a net bag you can dangle over the side in the cooler waters. This section summarizes the price of each island hopping tour in El Nido. All island hopping tours include buffet lunch and snorkeling gear. Prices may vary by the tour agency. Motorbike rent – Php 450 to Php 600 per day (8 to 11 USD). Day 4 of our Palawan adventure where we had El Nido Land Tour or some call it “El Nido Tour E“. If you decide to go there on your own, you can either hire a tricycle or rent a vehicle. We hired a tricycle (Kuya Danny, 09183431892) to go to Nacpan Beach plus other places the newly opened Lio Beach and Las Cabanas Beach that costs around Php 1000 good for 2-3 people. Meals range from 70 – 100 pesos (1 USD) and include rice meal and soup or vegetable. 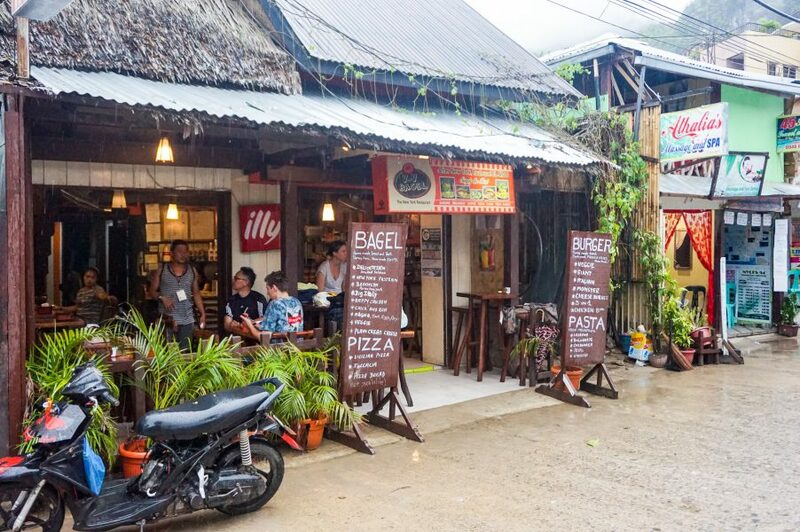 While nice bar and restaurants range from 150 – 300 pesos (6 USD) per meal. 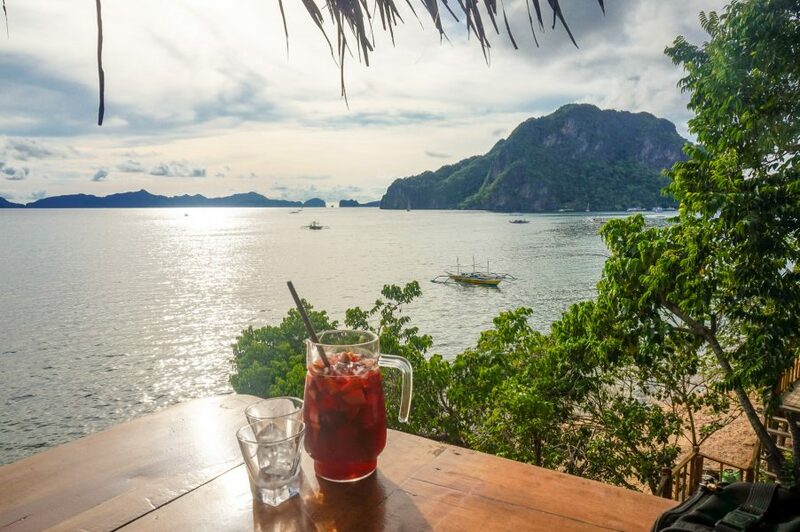 Rooftop Bar is an open-air bar located in the heart of El Nido. 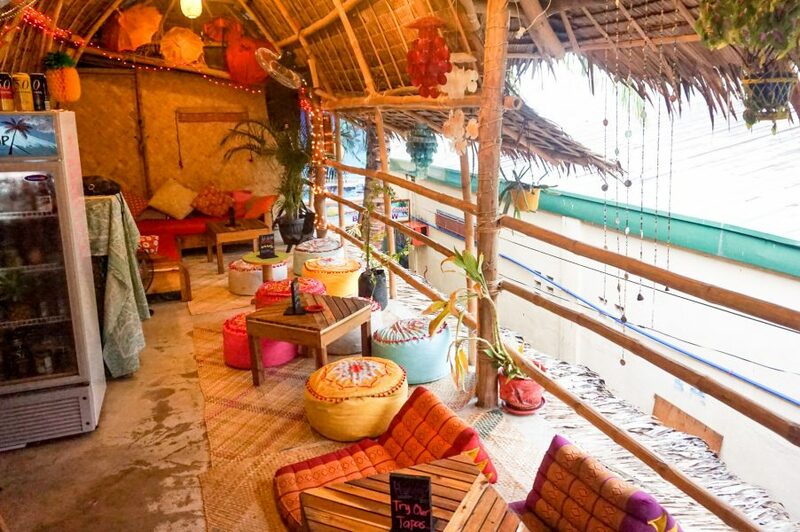 Here is a perfect place to chill, explore & enjoy original cocktails and food in a typical bohemian atmosphere while listening to some good music. V and V Bagel is a New Yorkean restaurant that serves burgers, bagels, pasta, pizza, also they have a good quality coffee and espresso and they serve also fresh fruit juice, shakes, and frappes. Republica Sunset Bar offers premium cocktails, exclusive Spanish tapas, paellas, according to time Music & the best Sunset in El Nido, Palawan. The last day of our Palawan adventure we went by shuttle service from the front of our hotel at 4 in the morning going back to Puerto Princesa City. We had limited time, as our departure is at 3pm in the afternoon, we just decided to tour the city than doing the Honda Bay Island Hopping tour. If you have a whole day to spare in Puerto Princesa, you may opt to try the Honda Bay Island Hopping Tour. In the morning of your tour, an aircon van will come to pick you up at your hotel between 7:00 and 7:30AM. It will take you to Honda Bay, only 40 minutes away from Puerto Princesa, where you’ll hop on a boat and start your island hopping tour. During the day, you’ll get to stop on several beautiful beaches and islands, where you can relax, swim or snorkel. The most popular islands are Starfish Island, Luli Island and Cowrie Island. These are the ones generally included in your Honda Bay island hopping tour. Nonetheless, please note that due to weather conditions, the itinerary of the tour may change. It may then bring you to Pandan Island, which is the jewel of the Honda Bay. At the end of your day, the air-conditioned van will bring you back to your hotel in Puerto Princesa proper. All the hotels in the area sell essentially the same tours taking in the nearest sights for around P600 per person in a minivan, or P500–700 per tricycle (Honda Bay and the Underground River are more expensive). You can also try negotiating with tricycle drivers in the street, but you are unlikely to get much of a discount. Experience the all bamboo restaurant and go barefoot while at Kalui Restaurant. Before feasting on their food, you can entertain first yourself visually with the paintings & other ethnic and indigenous artworks decorating the place. This laid-back sports bar has open-air dining, pool tables, and live music, making it a chill hangout. 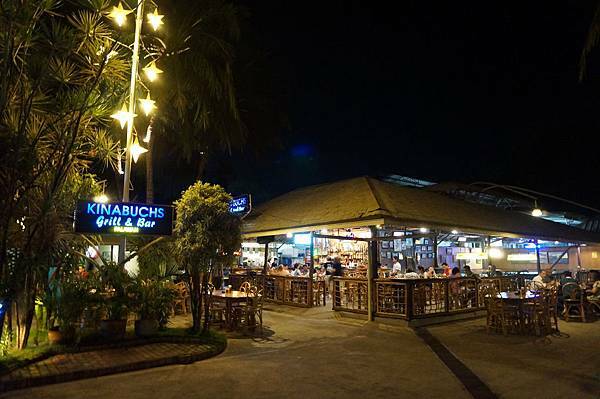 Kinabuch’s serves Filipino favorites like Crispy Pata, grilled squid, and gising-gising. Their large open-air pavilion is nice, breezy, and seemingly promised a good dining experience for every guest. Adding to the ambiance is the view of the sea. One may cross a bridge that connects the restaurant right into the sea. Ka Inato is a native restaurant that specializes in chicken inato (a version of inasal) and other Filipino dishes like sinigang, inihaw, grilled squid and crocodile sisig. The restaurant has very artistic interiors and is decorated with colorful wooden sculptures and carvings that Palawan is known for. There are some ATMs in El Nido (BPI & RCBC), but safer not to depend on them as they often run out of money. Withdraw cash while you’re in Puerto Princesa or Manila, before coming to El Nido. Always have cash as most smaller traders can only deal in cash. Do not drink tap water. Order filtered water (in a sealed bottle). Even think about iced drinks, make sure that ice cubes are made from filtered water as well. Electricity is now available 24/7. Restaurants are all around town but are a bit expensive. Meals good for one person are usually around P200 at the lowest. There are cheap options but the food options are dubious so don’t expect them to be not as good as the expensive ones. El Nido is a pretty small town so if you plan to see more of it, I suggest you walk. There are some Tricycle drivers there and they are in general friendly, But there are not many of them. Watch out for the overchargers! Most establishments prefer cash. Only a few resorts and restaurants accept credit card transactions. Many tour agencies are on cash-only basis. Some restaurants and pawnshops exchange major currencies to Philippine pesos, but the exchange rates are very bad and they are not always open, so it is best practice to have pesos before you arrive. Exchange while you’re in Puerto Princesa or Manila. Most hotels offer free wi-fi but it is mostly very slow and of poor quality. Both Globe and Smart have good reception in main towns so it’s often better to just use cellular data, but try putting your phone down – you’re on holiday! 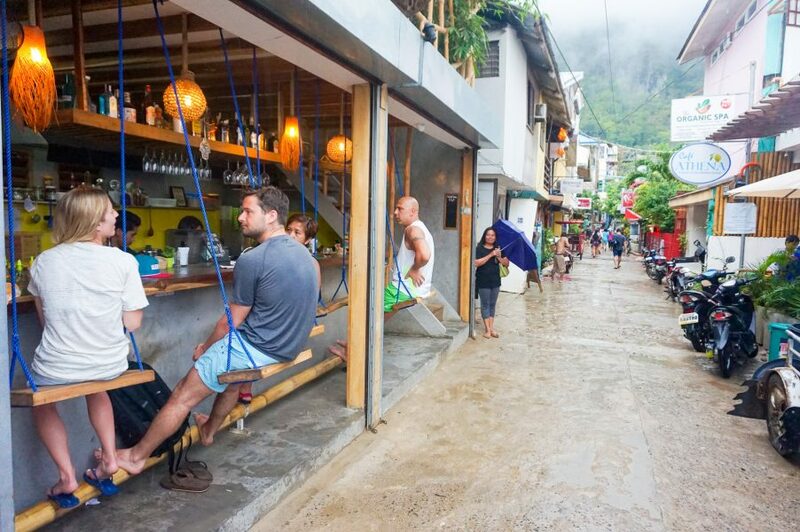 El Nido has a very, very low crime rate. But please don’t leave your belongings just anywhere. There are also no hospitals here and the nearest major medical center is in Puerto Princesa. There are no aliens, terrorists and Cerberus died last year. You must pay Php 200 Environmental load (EDTF). This is valid for 10 days. *Expenses may differ depends on what you eat or where you eat plus your accommodation and airfare.